Happy New Year! With a couple weeks off from work, I've been tinkering a bit with It's Pub Night. For instance, the ugly banner that used to take up a third of the screen has been replaced by an ugly banner that only takes up about a sixth of the screen. But what I'm really excited about is updates from Twitter posted to the blog, and notification of new blog posts going out as Twitter updates. I set up a Twitter account back in April, but I didn't really participate in it. I didn't follow anyone, so when I went to my Twitter account, I only saw my own infrequent boring updates. For those of you unfamiliar with Twitter, to "follow" someone is to see the short messages they post on Twitter. Those short updates are called "tweets", and you can send them from your computer or as a text message from your cellphone. It was starting to look like I would only use Twitter to keep a record of bruises, so later when I wondered where a particular bruise came from I could log on and find the tweet for it. Then a few things lit a fire under me. I had admired a couple of beer applications of Twitter: the Beer Mapping Project's geocoding that allows you to map your tweets, and the Champagne of Blogs' Twitter feed. And then on one of our snow days, after tweeting that the Bridgeport Ale House was closed, one of my 3 stalwart Twitter followers -- Ezra the Samurai Artist -- replied to my tweet. Holy Cow, my first reply! I have a social network! Ezra encouraged me to raid his "following list" for more Portland beer types. That's the key to the whole business: Twitter doesn't make any sense until you start following a few friends, acquaintances, and pubs. I finally get it. Let me give you a tour of some of the exciting features of the Twitter feed in the sidebar, which is produced by a script supplied by Twitter. The first red circle in the picture is around a link created by a Twitter "@" reply. It's a link to the page for the person I'm replying to -- in this case to Dave Selden (Champagne of Blogs guy) -- so you can check out that person's tweets if the reply piques your interest. 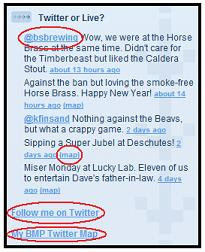 Even better, I hacked the Twitter script so that tweets tagged with a Beer Mapping Project location ID get a "map" link -- the second red circle -- that takes you to the BMP's page for that location (Deschutes' Portland pub in the picture). The third red circle takes you to my Twitter page, where you'll get a chance to follow my tweets and get messaged every time there's a new post on It's Pub Night. Last but not least, is a link to a Beer Mapping page that maps the most recent tweets that I bothered to tag with locations. I try not to make blog posts about the blog itself, and I don't plan to make a regular practice of it. But I was so excited about the recent geekery that I wanted to explain what it was all about. If you get half as much enjoyment out of it as I do, then I'll get twice as much as you. Technology is a great thing if you are geeky enough to appreciate it! I have no doubt Twitter will get you more well deserved readership. It has been working well for me to get my beer and music events more attention. Hope you can make the next tasting Bill!